The Global Human Ecodynamics Alliance (GHEA) is an organization of social scientists, natural scientists, historians, educators, students, policy makers, and others interested in promoting cutting-edge research, education, and application of the socioecological dynamics of coupled human and natural systems across scales of space and time. GHEA membership is free and open for participation to anyone who registers and agrees to follow the GHEA rules. We currently have over 200 members. The GHEA login and registering system was updated in 2014. This means that no passwords are held in the GHEA database and instead this is dealt with by the University of Edinburgh's central EASE system. Fresh instructions are now available for new registrations. All exisiting users will only need to register with EASE once and your details remain unaltered. You do not need to register as a GHEA member again. IHOPE have put together a theme to establish the threats to our heritage from global environmental change. These threats include wind, the sea and rising soil temperatures. This is destroying invaluable archaoelogical records and often previously unknown sites. The American Anthropological Association's Global Climate Change Task Force produced a report Statement on Humanity and Climate Change, which highlighted eight main points. More details on this new IHOPE Theme are available here. NOAA Sea Level Rise Viewer: for most of the contiguous USA, Saipan, Puerto Rioc and US Virgin Islands, Guam and Hawaii. Climate Change and California Archaeology Studies: The Society of California Archaeology study of the impacts of climate change (including sea level rise on archaeology in the state. Climate change impact on the Point Reyes National Seashore, Marin County, California: this study is on the impact of climate change on indigenous archaoelogical sites by the Anthropological Studies Center of Sonoma State University. This video was shot by Regan Alsup and shows the impact of coastal erosion on the archaeology of Brora, Scotland. The SCAPE Trust (Scottish Coastal Archaeology and the Problem of Erosion) aims to conserve and promote the archaeology of Scotland's coast. The related SCHARP (Scotland�s Coastal Heritage at Risk Project) aims to provide opportunties for the public to take part in archaeological and historical exploration and discovery. Together with IHOPE, the research node Mind and Nature at Uppsala University announces a call for papers for a student-focused workshop on Historical Ecology: The Next Generation in Uppsala, Sweden. The workshop, to take place November 12-13 2014, will provide early stage researchers a venue to discuss their perspectives on the study of human-environment interactions over the longue duree. Students in earth and social sciences and humanities are encouraged to present their own research applying aspects of historical ecological analysis. The event aims to generate conversation regarding historical ecology's future as a theoretical framework for addressing interrelationships among societies, environments, and climates. More information can be found here. Interested participants are invited to submit an abstract for an oral presentation by September 30 2014. The Inscribing Environmental Memory in the Icelandic Sagas (IEM) project, which aims to link literary and historical studies of the Sagas to environmental records, has launched its own webpages. IEM aims to bring together scholars working on Icelandic/Scandinavian/North Atlantic history, literature, archaeology, environment, and climatic change. Further details are available from the NABO IEM and the Network for Interdisciplinary Environmental Studies (NIES) websites. A two week (August 1st - August 15th 2014) summer course (10 ECTS*) in Iceland for Masters and Doctoral students with interest in supplementing their studies that fall within the following disciplines: Literary Ecocriticism, Environmental History, Environmental Archeology and Environmental Anthropology. Application deadline May 7th 2014. Further details on this course..
BBC 4 are showing a 1 hour 30 minutes programme written by Jago Cooper on his research into the collapse of the Easter Island civilisation. The programme is being shown on BBC 4 on Thursday 30 January 21:00 GMT, Friday 31 January 0.05 GTM and Tuesday 4 February 22:00 GMT. It will also be accessible on BBC iPlayer. "This film examines the latest scientific and archaeological evidence to reveal a compelling new narrative, one that sees the famous statues as only part of a complex culture that thrived in isolation. Cooper finds a path between competing theories about what happened to Easter Island to make us see this unique place in a fresh light." More information on this programme. November 4th-6th 2013 at the University of Maryland, College Park. Dr. George Hambrecht, Anthropology Department, University of Maryland, College Park. 0111 Woods Hall, University of Maryland, College Park, Maryland, 20742. Email - ghambrecht@gmail.com. Skype - George Hambrecht. Further details about this meeting are available here. The Vilnius Declaration established the European Environmental Humanities Alliance, more details on this initiative are available here. Humans are the key factor in both creating and solving the challenges of global environmental change. The emerging field of the Environmental Humanities represents an under-utilized resource of knowledge, activity and practice that can and must be activated and integrated with the other sciences to guide a more humane transformation of environment and society. More details are available on their website and there is considerable overlap with the aims of the GHEA community. 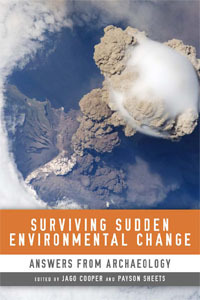 Cooper, J and Sheets, P. (eds) (2012) Surviving Sudden Environmental Change: Answers from Archaeology. University Press of Colorado, Boulder p256. HERC Launch: The Human Ecodynamics Research Center (HERC) at the CUNY Graduate Center is coordinating the effort of scholars in a formal research collaborative addressing crucial issues of sustainability, resilience, and the future of humans on earth. HERC focuses on the past and present global interactions of humans and the natural world, using fields of inquiry and methods of investigation from anthropology, archaeology, sociology, geosciences, climatology, biological sciences, art, history, and political science. The Working Groups section of the website is now available. GHEA members can create working groups and join groups that have already been created. Non-GHEA members can read the Working Group pages, public posts in the forums, but cannot contribute to the forums or view private posts. GHEA sees the expansion, integration, and augmentation of cutting edge human ecodynamics basic research, education, and science-based policy as critical to the development of a more sustainable approach to human-environment engagement in the future. This research must include the integration of a temporal perspective in short medium and deep time scales. We believe that as a result of focused efforts, by 2020 society can be better equipped to utilize the results of this research for practical problem solving. GHEA exists to facilitate greater communication, collaboration, and engagement in human-ecodynamic research, education and policy by operating as a "bottom-up"�, community-driven entity. This web portal is set up to facilitate individual participation in GHEA. The effort will succeed only through the efforts of participants. Modeled after other successful, grass-roots movements, this web site has been created to allow users to define the directions and emphasis of GHEA identity, activities, and productivity.